An easy no-bake peanut butter cup cheesecake pie on a chocolate graham cracker crust with a rich creamy filling loaded with chopped peanut butter cups and piled on top. Calling all peanut butter lovers! Boy do I have a special treat for you today. 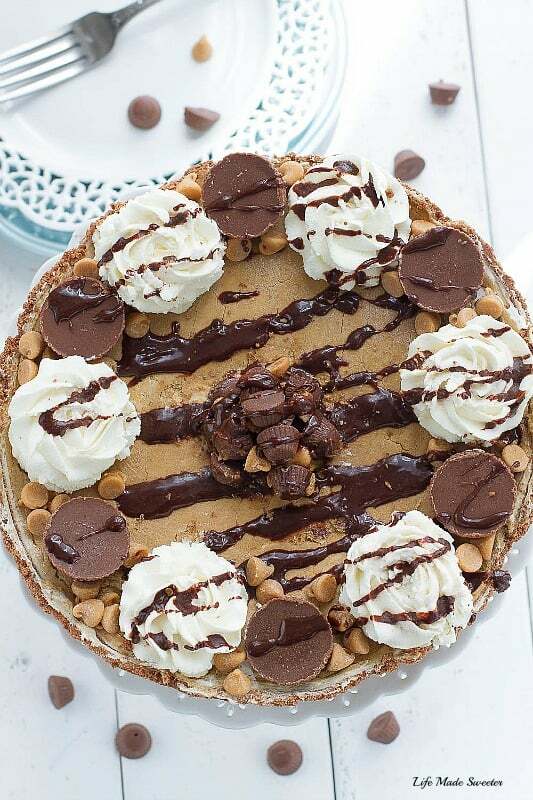 This No-Bake Peanut Butter Cup Cheesecake Pie is not only simple to whip up, it’s loaded with two sizes of Reese’s peanut butter cups AND peanut butter chips — plus it’s completely no-bake. No-bake desserts are the best during the summer heat when you need to bring along a sweet treat to a potluck or a party but don’t want to turn on your oven. I made this pie a few weeks ago to bring along to a friend’s bbq since she is a big peanut butter fan. I based it off of the No-Bake Cinnamon Peanut Butter Pie I made earlier in the year and decided to add some peanut butter cups this time. Best. Decision. Ever. The pie was polished off in no time with no leftovers. It starts with a no-bake chocolate graham cracker crust that is really easy to make. Feel free to use a premade store-bought crust if you’d like. The peanut butter cream cheese filling is rich, creamy and totally irresistible especially once you add the chopped peanut butter cups. It’s topped off with both regular and mini peanut butter cups, a handful of peanut butter chips and some drizzled hot fudge sauce. Finally a few dollops of whipped cream ties everything together. This pie is rich, decadent and overflowing with flavor. It’s packed with plenty of chocolate and peanut butter making it a total chocolate and peanut butter lover’s dream and perfect for sharing at your next summer barbecue. 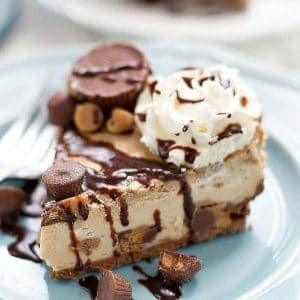 An easy and decadent no-bake peanut butter cheesecake on a chocolate graham cracker crust loaded with chopped peanut butter cups in the filling as well piled on top. Place graham crackers and sugar into the bowl of a food processor and pulse into fine crumbs. Add the melted butter and process just until the crumbs are moistened and stick together when you press with your fingers. Press into a 9" pie plate or springform pan using a spoon or measuring cup to compress crust down. Place in the freezer while you make the filling. In a separate large bowl, beat the softened cream cheese until light and creamy. Add the peanut butter and vanilla extract until combined then slowly add the powdered sugar until uniform and well incorporated. In a separate bowl, use an electric mixer with the whisk attachment to whip the heavy cream until stiff peaks form. Gently fold the whipped cream into the peanut butter mixture. Stir in the chopped peanut butter cups. Pour into the prepared pie shell and freeze until set for about 3 hours. Garnish with whipped cream and top with peanut butter cups, peanut butter chips, fudge sauce or melted chocolate if desired. Store in the fridge covered, for up to 3 days. Oh Kelly! It is Monday and I am trying to get back on track after a weekend of “relaxed” eating and then this pops up on my screen haha. Definitely something for next weekend. Mmmmmm! Yum Kelly! This is complete, total, dessert heaven! Nothing beats a peanut butter cheesecake in my opinion, and I love that it’s no bake! It looks stunning too. Pinned! It looks so irresistible! So tempting! No-bake desserts are definitely the best in the summer, especially ones that involve cheesecake! This looks amazing, Kelly! I love that this is jam-packed with peanut butter. Sounds like the perfect summer dessert! Thanks for all the pie love Gayle! This no-bake pie looks fantastic, Kelly! 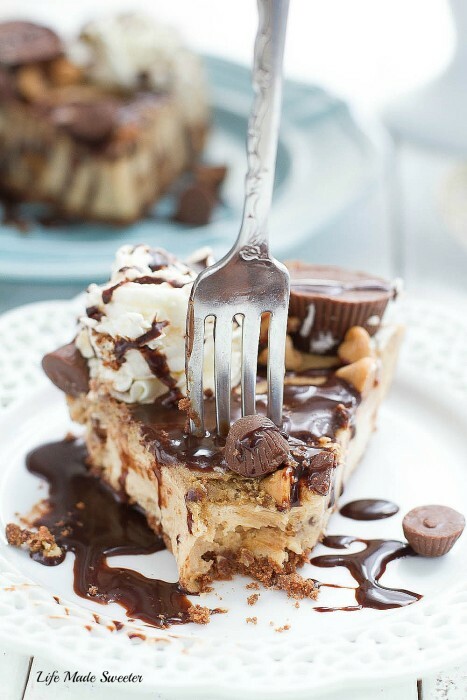 Peanut butter and cheesecake — ummm, its an amazing combo! Stunningly delish! Kelly – I have a weakness for peanut butter desserts! You’ve totally convinced me that I need this one in my life. Thank you for sharing. It looks way too yummy. Oh my gosh. This cheesecake has MONDAY written all over it! And no-bake too?? I’m obsessed. There’s just so much to love here! Seriously, this pie must have been such a hit at your friends BBQ! Peanut butter and chocolate is a pretty amazing combo to me – but, when it comes in a no-bake cheesecake – well it’s simply irresistible! Wow Kelly!! What a pie! And it’s no bake which is a huge bonus 🙂 It’s absolutely beautiful and you decorated it so lovely! This. Is. Beautiful! I can see that it’s overflowing with flavor! Love it, Kelly! Thanks for sharing! Kelly, wowza!!! what a delicious looking pie!!! I love the no-bake and am actually making something no bake right now for Wednesday! 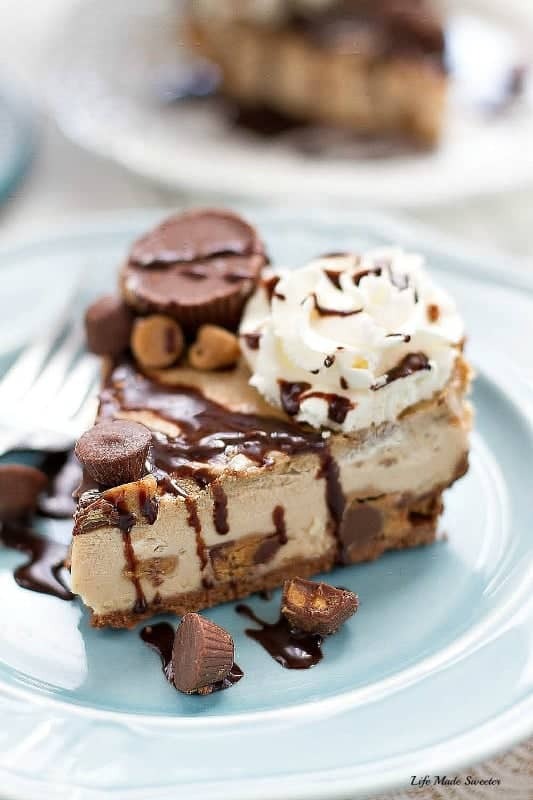 😛 love this no-bake-peanut-butter-cup-cheesecake-pie!!!! Oh my – this really is a peanut butter and chocolate lover’s dream! I love the chocolate graham crust on it, too. It looks incredibly tasty and just perfect for a gathering (more people to show it off to!). Those were some lucky people who got to sample this pie! I am itching to make something no-bake now because I have really noticed how crazy hot it gets when the oven is on (which is way too often when we’re home)! Love it! Love no bake desserts and wish I made them more often! This looks fabulous! Pinned of course! Peanut butter and no bake! Two of my favorite things! I definitely want some of this pie! Yes yes to anything with peanut butter and chocolate! This pie looks absolutely fantastic! Did you change your blog design?? I really like the new (??) look! So pretty! This sounds heavenly!! I love no-bake pies! Look at the beautiful, creamy peanut butter cheesecake filling!! Wow! I think I would go absolutely nuts for this as I love anything with peanut butter. 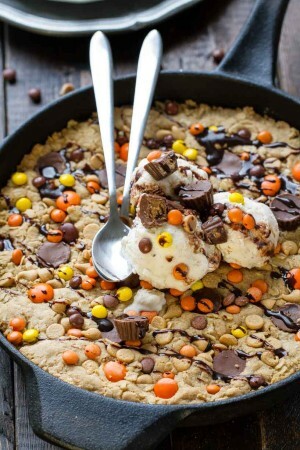 The fact that it’s got little peanut butter cups too is to-die-for! Gorgeous cheesecake, Kelly!! It was pretty decadent and dreamy but luckily there were lots of people to share it with 🙂 Thanks Beeta! This is just too awesome, I love it! I think I’d eat the whole thing myself! I am a peanut butter cup fanatic! Never mind that it’s a no-bake cheesecake. LOVE this Kelly — pinned! Thanks Ashley and for pinning! I made a pie very similar to this one over the weekend! It was so good, and yours looks amazing too! Love that you drizzled yours heavily with chocolate syrup – genius! Oh my. This looks so wonderfully sumptuous and decadent I’m going to need an entire army of people around me when I make it to prevent me from eating it all. It looks absolutely ideal for a barbecue, as you said, so shall be trying ASAP (especially since London has decided to be warm this week). Looks like a killer cheesecake, Girl! Love it! Cheesecake, pie, peanut butter cup…is there anything richer and tastier than this? Fantastic job, Kelly. Can I please be your neighbor so I can have your leftovers? You bake the best things! This seriously looks perfect! Chocolate and peanut butter has to be the best combination in the food world…at least in the dessert world! Love that this is no bake :). Oh my goodness this dessert looks amazing! Cheesecakes are perfect for summer when you need a cool, but delicious, dessert! My kind of cheesecake! 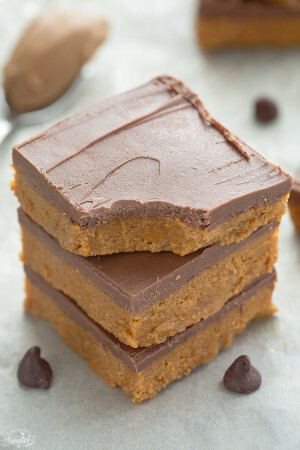 Can’t get enough chocolate and peanut butter and I love that it is no bake! Ekkkkk! Its heaven on a plate (or a blog)!!! This looks like the best dessert ever, it makes me so happy! Amazing Kelly! Oh my, that is one of the best looking desserts I’ve ever seen! Peanut butter cups and cheesecake is an absolutely fabulous combination! True, this is the season for no-bake desserts. They are so easy to make and they just taste as they should in the summer time. Good and not too heavy. It’s 6:08am and I could eat this for breakfast! YUM! Wow! This is my jam! So decadent! This looks so good! I’m about to dive into no bake desserts now…it’s getting way too hot! I can barely stand how amazing this looks. No bake is where it’s at…this is fabulous! HI Kelly, I found your recipe on Stumble Upon this morning and wanted to read more. It looks absolutely delicious, you made it so pretty!!! I would like to invite you to share on my Friday Features linky party this week. Hope you have time to stop by and while your there check out the other features. I have pinned your recipe and stumbled as well.